The ultimate tool for customer support. Streamline all customer processes. Set your SLAs and provide your clients with top quality support and increase their satisfaction using Easy Redmine Help desk. Explore Help desk plugin Easy Redmine 2018 free trial. Management and assignment of tickets have never been easier! With new Help desk dashboard, you can efficiently handle your ticket and available resources. There is no need to open every ticket and create an update for assignment of responsibilities. You can just preview your tickets at the ticket pool provided by Help desk dashboard to identify the resources need to the given problem. To assign a specific ticket to a certain worker or special group of tickets, simply drag that ticket to one of your “easy buttons”. What are easy buttons? They are fully customizable buttons that you will find on the Help desk dashboard and other plugins of Easy Redmine. Create and adjust them in settings, and use them to drag and drop your tickets to a specific person, category, ticket type, etc. What is the overall benefit? Easy manipulation of tickets without the need to leave the main dashboard, thus providing a convenient and efficient way of managing your Help desk. Help desk Kanban ticket management from Easy Redmine is the ultimate tool for easier and more organized ticket processing. 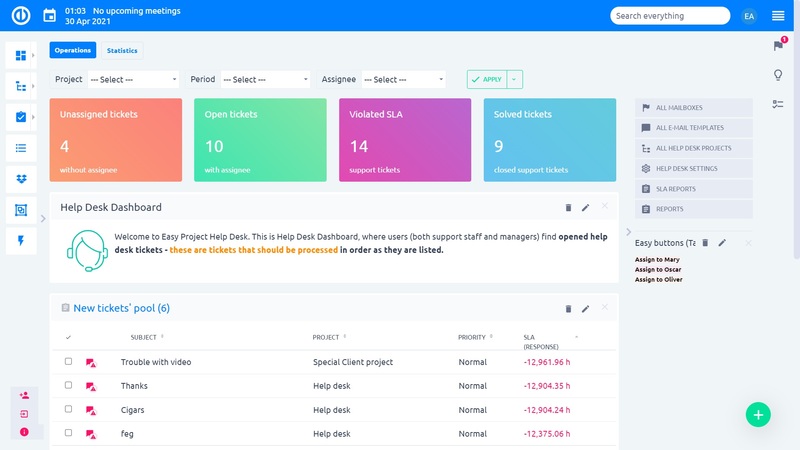 Help desk backlog gives you a comprehensive overview of the statuses of the tickets and a nice visualization of the current state of progress. 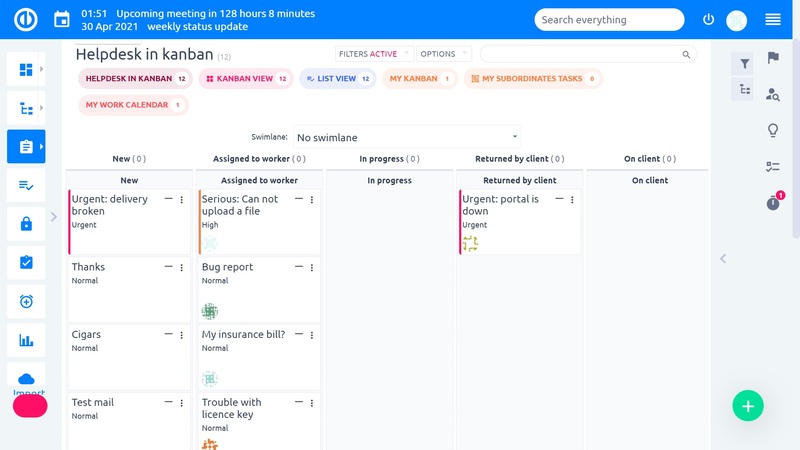 The Help desk Kanban ticket statuses are customizable, thus you can either select from the list of existing statutes or create your own. Would like to have a clear overview of your support clients? Help desk Project feature can help you with that! 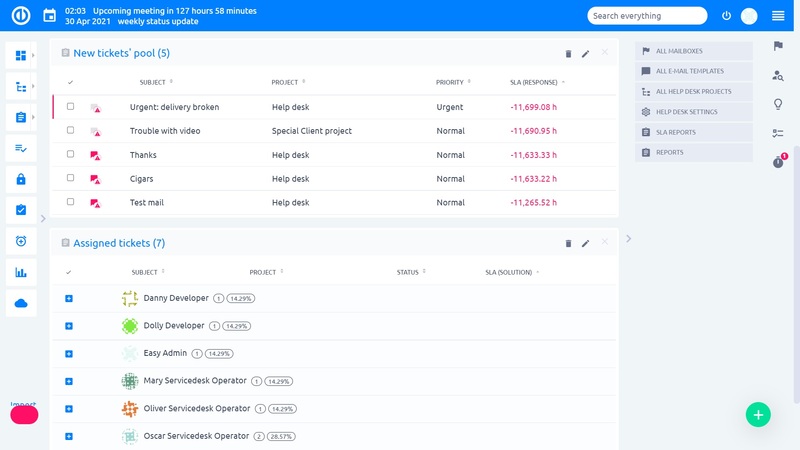 Project overview allows you to set and observe the number of contract hours according to SLA, the number of hours that have been already worked and the remaining hours. In addition to that, it provides with color coding for each project, which gives you with a nice visual representation of the current statuses of projects. Furthermore, you can easily categorize your projects, for example of the basis of the importance of particular customer or the level of services provided. 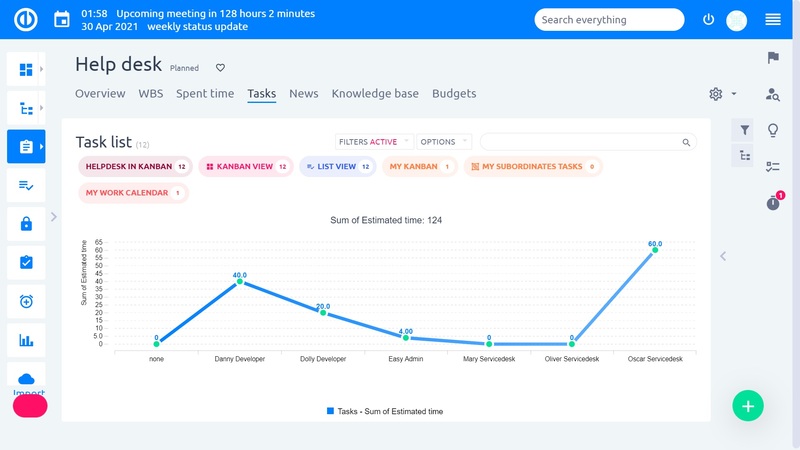 Tracking performance of you Help desk has never been easier. Thanks to the statistics feature you can get a quick overview of your support service performance. Help desk Statistics are incredibly customizable. For example, you can view performance by users, which shows you the number of closed tickets by a specific person, or by ticket status. You can view and compare statistics for a different time period, allowing for a good cross-sectional analysis of Help desk performance. All of these can be at your fingertips with the new Help desk statistics feature by Easy Redmine. Using complex settings you can customize various parts of your Help desk. For example, you can create email templates for auto-replies and corporate logos and signatures. You can also configure you projects for automatic ticket assignment and set specify SLAs. To help you with installation and management of your Help desk 2016, we have created an easy to follow manual. There you can find explanation of all the settings and detailed description of the terms used in the Help desk by Easy Redmine. Follow the steps of our complex Redmine Help desk cookbook to get your Help desk up and running in no time!